Legend's Weekend Set for April 19-21! Legend&apos;s Weekend Set for April 19-21! Relationships that have been built and grown with local business partners and organizations has enabled the Visit Stillwater team to best leverage existing community amenities and assets. These relationships enable us to not only meet, but exceed expectations of our visitors. April has historically been an event-heavy month for Stillwater. This year is certainly no exception. As a result of the highly successful “Legends Weekend” concept in the past, several local organizations are once again working together to cross promote events creating additional exposure for the variety of options available to visitors the third weekend in April. In the past, event planners were marketing and promoting their events independently of one another and unaware of the additional events taking place over the same period of time. Visit Stillwater connected each of the event planners to enable them to cross-promote one another’s events. The cross-promotion concept does not increase the cost of marketing for any individual event planner. However, it increases exposure of their event through multiple other marketing avenues throughout their fellow local event planners. Due to the variety of events being held, we are able to target a broad audience which includes Cowboy football fans and past players, runners, art enthusiasts, live music fans, and more. There are events for people of all ages, genders, and interests which will attract an increased number of visitors to our community. Additionally, there is a much greater potential for visitors to lengthen their stay as a result of this cross-promotional strategy. Event planners are encouraged to include the “Legends Weekend” logo and website link within their marketing materials and mention the link through promotional efforts. This enables visitors, as well as residents, to easily locate the variety of events taking place throughout the weekend on a single website. It also means event planners only need to include one additional logo on their marketing materials, rather than numerus logos representing each individual event. Legends Weekend is promoted across all marketing platforms, as well as internally and externally to Stillwater, by several local businesses and organizations. Legends Weekend represents the great example of local organizations partnering through a singular cross promotional strategy. The weekend-long event has been recognized with a Red Bud Tourism Award for Outstanding New Event and Best Partnership. 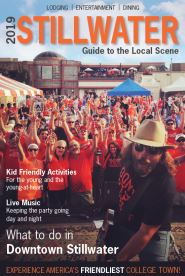 For a full lineup and specific details about Legends Weekend 2019 events, go to VisitStillwater.org/legends.